Sea bass is a lean saltwater fish that is meaty and great for grilling. However, most types of fish referred to as sea bass are not actually bass. Although unrelated as species, these fish have some similar characteristics, which is what is important for grilling. Those doing the eating really don't care too much about scientific names. If it tastes similar, cooks similar, and looks similar, then it's sea bass. This allows you to use a wide variety of fish for one recipe or one fish for many recipes. Black sea bass is a true bass, like the freshwater striped bass. They are harvested in the western Atlantic Ocean from Maine to Florida and you can often find whole fish of up to 2 pounds. For the best eco-rating, choose trap-caught or handline-caught fish rather than trawl-caught fish. The white sea bass is actually a type of fish called a drum or croaker, which is not really a bass. It is native to the Pacific waters from Alaska to Baja California. They are a popular sport fish and are commercially harvested. They are given a "best choice" rating by Seafood Watch if they are caught on handlines, with good alternatives being those caught in drift gillnets or set gillnets. The controversial (but very popular) Chilean sea bass is actually a Patagonian toothfish (also called the Antarctic toothfish) and is a type of cod. It was relabeled because toothfish isn't an appealing name on a menu (especially at a premium price). They are prone to overfishing but currently receive an "OK" eco-rating. Look for the blue eco-label of the Marine Stewardship Council for preferred sources that are fished more sustainably. Meanwhile, giant sea bass are known as groupers. They are critically endangered and are native to the northern Pacific Ocean. They are protected from commercial and sport fishing and are unlikely to find being sold legally. When grilled, sea bass has a nice texture and wonderful flavor, making it perfect for everything from serving by itself or in fish tacos or salads. Sea bass is the fish equivalent to chicken breasts. If you really want something extra-lean fish, then look for sea bass. Sea bass has a mild, yet delicious flavor. Try not to overpower the natural properties of the fish with too many seasonings. Use at least a light brush of oil over the fish to hold the seasonings in place. 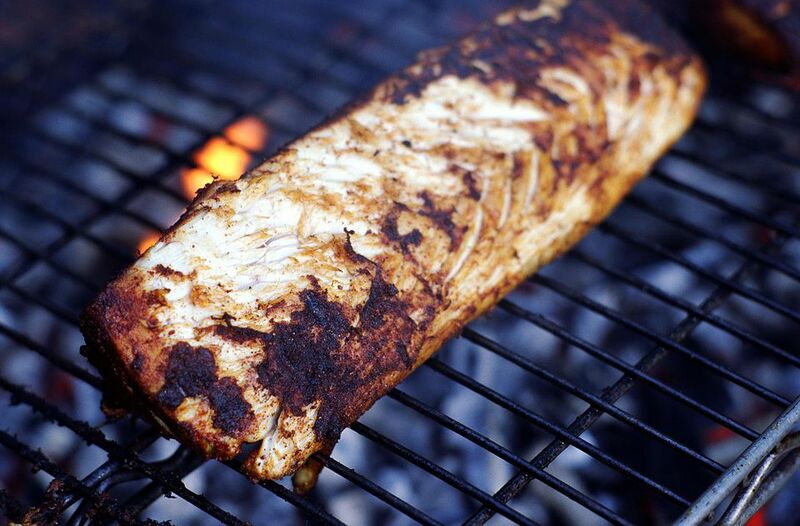 Of course, the basic rules of grilling fish still apply. Start with a well oiled and cleaned grill. Be aware that the fish will stick a little on the grill. Once fish starts to stick it becomes problematic, especially fillets that don't hold together as well as steaks. Avoid overcooking your sea bass, making sure not to dry it out. The fish is done once the meat is completely opaque through the middle and flakes easily with a fork. This means that if you take a fork to the middle of the fish and lightly lift the meat apart it will have an even color all the way through and won't hold together.